Around the world, a wingless thing flies, and on the way it whistles and cries. Sometimes it helps destroy towns and trees, but sometimes it relaxes humans and beasts. It can fly through holes so tiny, so small. It can fly through plains that are big and wide. From the north, to the south, it is feared when it comes. But also enjoyed by the people around. What is the thing? 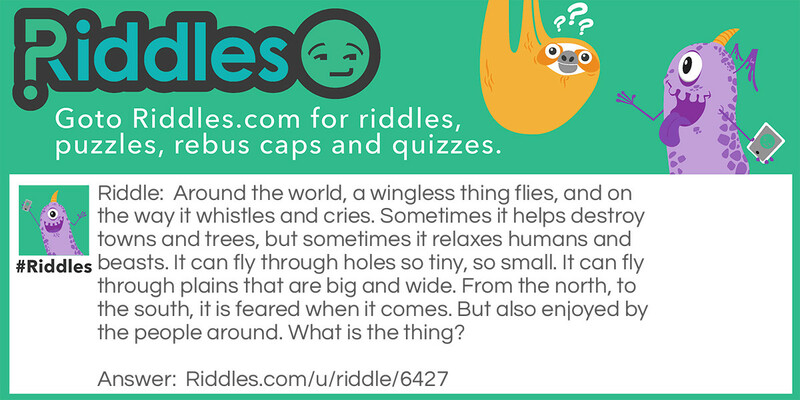 Wingless Thing Riddle Meme with riddle and answer page link.